There are multiple ways of getting from Hong Kong to Shenzhen which include the train, ferry and bus. With the two regions being close together, many people move daily between the two. It’s a popular route, and fortunately it’s not too difficult, so here we will provide a guide to the options. First: You’ll need a visa. There are many options for getting a China Visa in Hong Kong before heading over to Shenzhen. Many travel agents will assist with getting a visa, such as CTS, or you can apply to direct to the China Foreign Ministry in Hong Kong, and some visas are issued at the border. Many people will apply for the visa in their home country prior to travel such as via CVASC if you are in Australia. There is a short term ‘Shenzhen Visa’ which allows you to visit Shenzhen for 5 days, which is available at the border, to some nationalities. Visa laws are relatively fluid, and also vary based on nationality. This is the most popular way to connect between the two cities. It’s affordable and relatively straightforward (from Kowloon at least), although do note that the metro/train systems on either side of the border get really busy around peak transit times being the morning and afternoon rush hours, and on public holidays/special events. If you are in Central, or Tsim Sha Tsui, you’ll want to get to Hung Hom station and Take the East Rail Line as laid out further below. If you are in Mong Kok you can get onto the East Rail Line at Mong Kok East station or Kowloon Tong depending on which is closer. From Hong Kong Airport to Shenzhen, via Hong Kongs MTR (metro or subway if you like) you have to make 4 line changes before you get onto the East Rail Line which takes you to the Shenzhen/Hong Kong border at Lo Wu (called LuoHu on the Shenzhen side). And it will cost around 100 HKD. 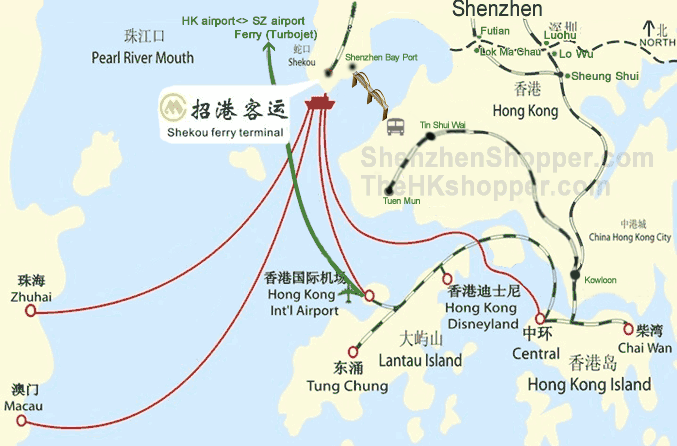 The ferry straight from the airport to Shekou Ferry Terminal is probably simpler especially if you are going to the Shenzhen districts of Shekou, Nanshan or Bo’an (more about the ferry further below). From HK Airport take the Airport Express train to Tsing Yi station and then transfer to the MTR line that heads to Lai King station where you get off again and transfer to the MTR line heading to Prince Edward station where you get off again and transfer to the line that heads to Kowloon Tong where you get off again and transfer to the East Rail Line. You can also catch the A43 bus at the airport and get off at Sheung Shui, then catch the train on East Rail Line to either Lok Ma Chau or Lo Wu, more about that below. Bus costs around 30 HKD and takes around 90 minutes. See the Hong Kong public bus company website http://www.kmb.hk/en which has journey planner, fares and routes. The East Rail Line takes you to either Lo Wu or Lok Ma Chau, when the train arrives at Sheung Shui station they will announce which station that train is going to. If the train is going to Lo Wu (louhu on the Shenzhen side) and your’e going to Futian District of Shenzhen, get off the East Rail Line at Sheung Shui and wait for the train (on the same line) that heads to Lok Ma Chau. The border crossing from Hong Kong into Shenzhen at Luohu is straightforward, it’s more or less two buildings on either side of the border connected via an enclosed bridge, for all purposes it feels like the same building. After departing the train simply follow the signs, have a completed departure card and your passport ready to show the Hong Kong border officer as you officially leave HK, then walk more or less straight ahead for a few minutes to reach the China mainland border officers. Show your completed arrival card and passport. Passing that point you’ll walk straight ahead and be in Luohu, where, if you are outside at ground level, you’ll see a large public square to one side of which will be Shenzhen Railway Station and to the other side Luohu Commercial City (the railway station is the longer of the two buildings) and two levels beneath you will be the Metro (aka subway). To catch a taxi, if you are at ground level, go down one level and kind of underneath the Luohu Commercial building you’ll find a large taxi rank. Check out photos of the area to help gain some familiarity Luohu. If you are going to Futian take the East Rail Line to Lok Ma Chau, and follow the signs through the Hong Kong border check point, go through China Customs into mainland China and you’ll be in Futian Port. In the same building is Futian Kou An Metro Station, this metro station is part of line 4 which connects with line 1. Refer to the picture below and the Shenzhen Metro map. Sometimes Lok Ma Chau border point is not as busy as Luohu, but both border crossings get busy during weekends, holidays and during the morning and afternoon ‘rush hours’ of people heading home/to work. 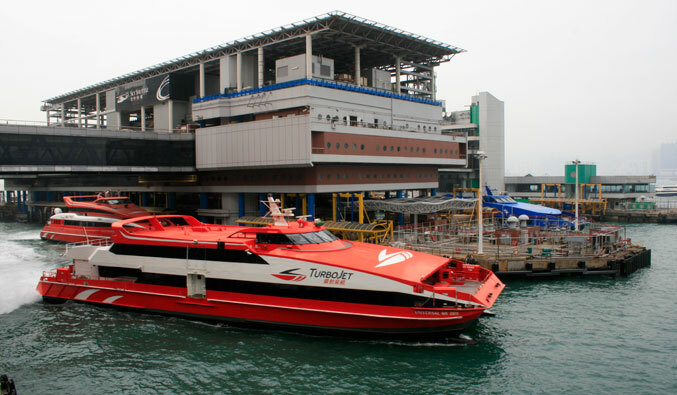 The ferry service departs Hong Kong from either the HK Macau Ferry Terminal/Pier (located at Sheung Wan), or if you have flown into Hong Kong and are leaving the airport directly to the mainland you can catch a ferry at the SkyPier. The ferry docks at Shekou Ferry Terminal, more information on the ferry that runs between Hong Kong Airport and Shenzhen here. The ferry between Shekou and Hong Kong Macau Ferry Terminal (in Central) leaves at regular intervals, and is a fairly comfortable ride taking around 1 hour and costing around 110RMB. Note you can get a discounted return ticket for 140RMB. The Shekou Ferry Terminal isn’t too big, so you certainly won’t get lost. When you arrive and depart the ferry, simply follow the pre-determined path, and through the small border checkpoint, showing the officer your passport and entry card and you’ll walk out through the waiting hall. It’s easily the fastest of all border crossings on the Shenzhen side. There is a taxi rank there and buses, there may also be people approach you asking if you want a taxi, they are generally unregistered private operators. A freshly opened metro (aka subway) began trial operations in Dec. 2010, known as the line 2 will connect you to the line 1 of the metro at the Window of the World Station, see 2011 Shenzhen Metro map which has details on all the five lines. This is perhaps the cheapest transport option for crossing the SZ-HK border and particularly convienient if you are in, or going to, Nanshan District/Bo’an/Shekou. If you time the crossing right it’s pretty quick and painless too, like everything in China though, it gets a little busy around 8am and 5pm. 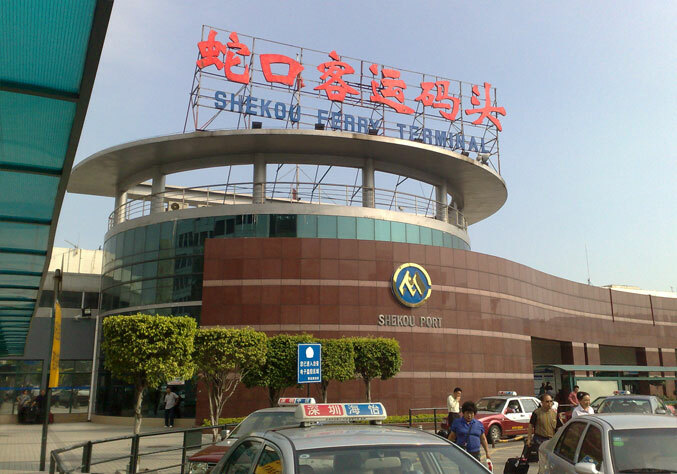 From SZ to HK : Catch a bus, or taxi to Shenzhen Wan (Shenzhen Bay Port). Public buses heading to the port are listed further below, and a taxi from Nanshan or Shekou will cost between 20 and 30 RMB. After you cross through customs you can catch public buses, or a taxi, to multiple destinations. As soon as you walk out of the building, head left, there’s signs pointing to the public bus pick up/departure area. KMB, Newbus and New Lantao Bus all have services running from this port. Hong Kong buses are clean, mostly new and in all my travels they are english freindly. From Shenzhen Wan to Kowloon/Central: Catch the B2P bus (timetable) and get off at the first stop being Tin Shui Wai Station (about 15-20 mins – 8.50HKD) walk up a small flight of stairs and across the pedestrian bridge into the rail station for the West Rail Line. This rail line runs through to Hung Hom Station (about 40 mins – 19HKD). 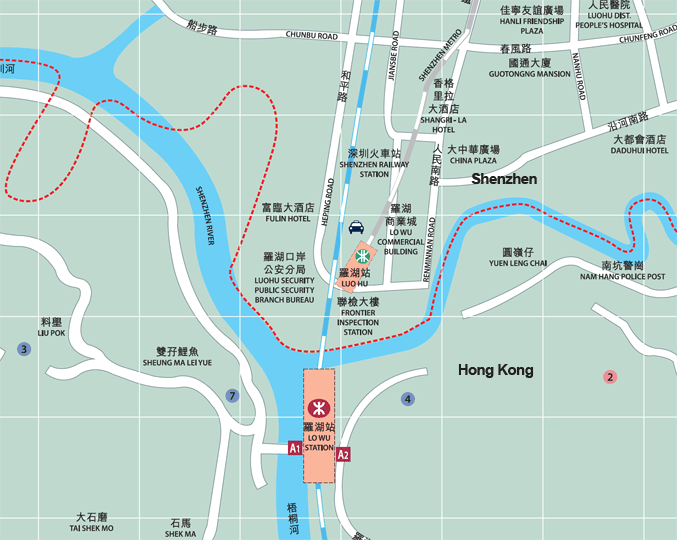 If you are going to Central you can transfer to the Tsuen Wan line at Mei Foo, or at East Tsim Sha Tsui (you’ll have to walk 5 mins to Tsim Sha Tsui Station), you can also transfer to the Tung Chung Line at Nam Cheong. The MTR Journey Planner to plan your trip on Hong Kongs metro/rail. From HK to SZ is simply the reverse, get on the West Rail Line to Tin Shui Wai then walk out Exit B, when you walk out the door turn right and down the stairs. From Shenzhen Wan to HK Airport/Asia World Expo: Catch the B3X bus (timetable) and get off at the last stop being Teun Mun Town Centre (20 Mins – 11HKD), cross to the other side of the road via the pedestrian bridge, walk under the building to see the KMB airport buses. There’s normally staff there to help guide you. Catch the E33 bus (timetable) to the airport (66 Mins 13.9HKD), or the A33 (timetable) (55 Mins 27HKD) both are run by KMB. You can also catch the B3 bus, but make sure you get off at the right stop as this one keeps going after Teun Mun Town Centre. From HK to SZ is simply the reverse, catching the E33 or A33 to the final stop, then take either the B3 or B3x to the border. If you are returning to Shenzhen Bay port 4pm there can be a line up for taxis, it could be handy to know the number of the public bus that will take you in the right direction. Buses terminating and departing from the port include 123, E19, 90, M206, 245, B602, B688, B737, B794, B813, B816 and a Shenzhen Airport Line more details. There are also buses which go between hotels in SZ, SZ Airport, Huanggang and Shenzhen Bay Port, to Hong Kong and out to Hong Kong Airport. See the links further below for timetables. 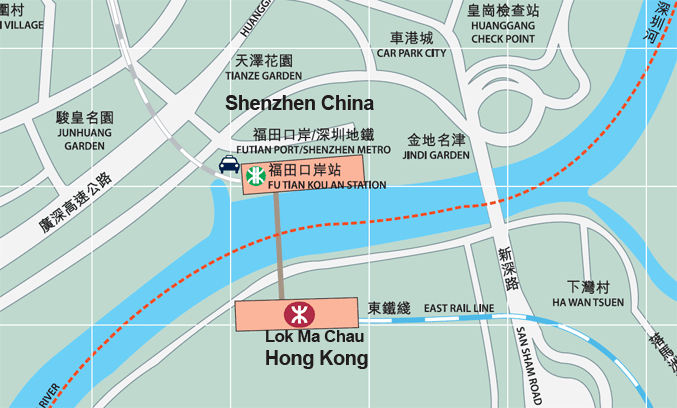 Hong Kong MTR Station Maps – maps of metro stations showing exits, nearby streets and attractions.